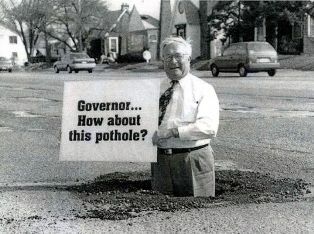 Michigan’s Fictitious Budget Surplus, Our Roads, What to do with a so-called $1.3 Billion Surplus? The projected multi-year $1.3 billion dollar surplus will give lawmakers something to ponder. While the governor has proposed yet again taxing the citizenry, us common folks for the $1.2 Billion he says are needed for our roads. 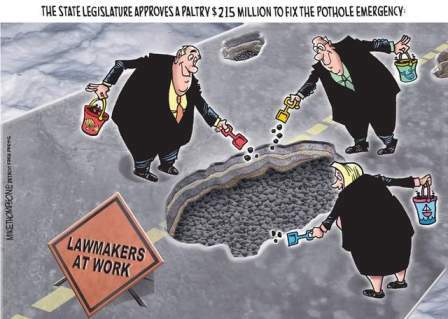 The legislature, bless the hearts was so kind in allocating a paltry $215 Million out of this $1.3 Billion so-called budget surplus (Taxpayer Money) to repair the potholes that quit frankly are beyond repair. So I guess that is to tide over the problem till after the elections so they can pass a gas tax and vehicle registration fee increase without immediate election year repercussions! 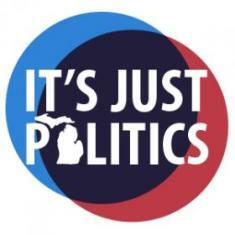 So while Governor Snyder and the Republican controlled legislature gave Big Business a huge tax break and balancing that loss of revenue on the backs of we lowly citizens we can look forward to these proposed tax increases that will be coming shortly after the 2014 elections.Vote wisely my friends! As I have reported earlier that Senate Majority leader Randy Richardville told the Monroe Chamber that there will be some sort of re-alignment but not until after the elections! Now this reported in the Detroit News, some Republicans in the House’s majority party say any long-term road funding fix may have to wait until after the November election during the lame-duck session when term-limited lawmakers may feel more comfortable voting for a tax increase. Now I have a novel idea how about we make sure they lose and don’t get the reward for raising our taxes yet again! If we don’t the message will be heard loud and clear in Lansing that it’s OK to keep raising our taxes instead of cutting the size and scope of an over bloated government. While raising my family in Allen Park I watched as my neighboring city Lincoln Park that tried unsuccessfully for several years in a row to get its citizens to pass a tax for their piss poor roads. Every year the citizens said hell no cut government until they let the roads get so deteriorated they finally gave in. But guess what, they used the money for other purposes instead of fixing the roads and the roads continued to deteriorate. This is exactly what Lansing has been doing for years with our road fund monies transferring that money for other unspecified spending purposes. Now that the road fund has been run dry they have the audacity to come to us taxpayers as to replenish that fund. If we allow them to levy us with yet more taxes in this regard we are complete and total fools. Patrick A Heller breaks down the “truth” about this “Fictitious Michigan Budget Surplus” in the three minute audio/video. Republican Governor Rick Snyder’s stern austerity policies, which include replacing “a business tax with a corporate income tax that is expected to save businesses $1.5 billion a year,” according to the same Times article. “To make up lost dollars, lawmakers agreed to tax public workers’ pension, reduce the state’s Earned-Income Tax Credit for the working poor, and remove or reduce other tax exemptions and deductions.” Those on fixed incomes such as seniors, retirees and the working class poor are now feeling the repercussions of Governor Snyder and the Republican controlled legislature’s tax policies that they have been implemented. I've mentioned this on another post, but for a guy who prides himself as a "numbers guy", his ability to flim-flam people with hard numbers that actually work is way up there with Pres. B.O.'s. Michigan would not have any budget problems if Lansing would just stick to what state government is supposed to do. For those who are a little clueless on this (read: Michigan republicans), this will get you back on the right track. If legislators were required to cite the relevant section in the Michigan Constitution for all of the appropriations that they promote, Lansing would be flush with cash without any need for new taxes/fees. But, instead of showing any integrity, they would much rather bribe voters with other people's money and hope that the producing class doesn't eventually catch on.